Have you heard of British brand Joules? They now have a US website! I want to live in the catalog! Just look at this adorable family outside of their little cottage in the English countryside. Perfection! I first heard about Joules from my friend M a few months ago. She came over last night for our weekly TV night and was wearing her Joules pajama pants that she got for Christmas. I fell in love with this sweatshirt and ordered it right away. I can't wait for it to arrive! And the sailor collar on this top! I am dreaming of spring (nautical is everywhere this year!) but I'm sure you've heard by now that good old Punxsutawney Phil saw his shadow last Sunday. I can't believe the amount of snow and winter weather the country is getting right now! While my sister was visiting LA there was freezing rain in Charleston. The bridge she takes to work froze! Yesterday one of my LA nanny friends sent me a photo of the snowman she made with her charge on their New York trip. I've been sending H to school in his fleece jackets and even put a hat on him one particularly cold morning! Spring hurry up! 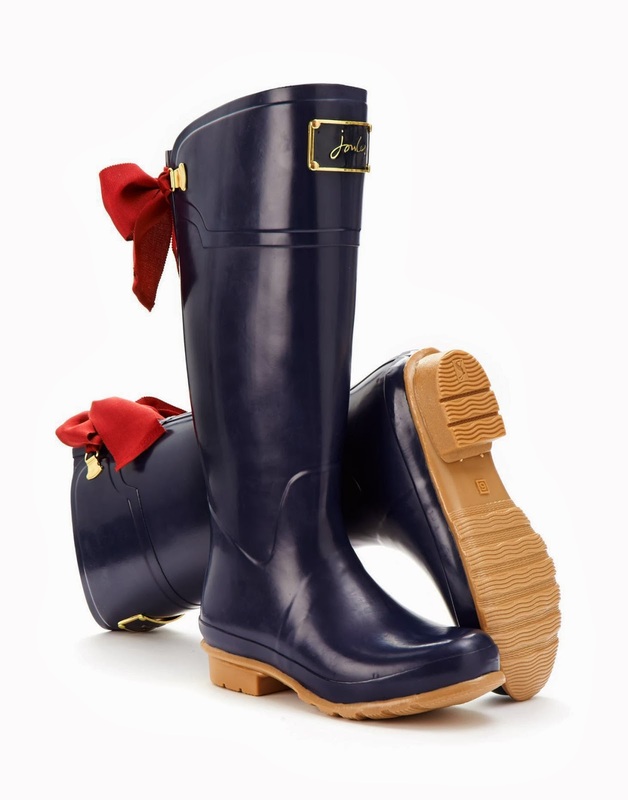 I think the Joules bow wellies are the cutest and they come in multiple colors! When I lived in DC I wore wellies in the snow (true California girl here-not going to brave snow in shoes!) and then of course when it rained in spring and summer. But I would get so warm wearing regular wellies during summer showers. Joules has two shorter boots that would be perfect for those warmer weather rain showers. I love the rain boots with the bows in the back! Sooooooo cute! Love the boots with the bows and the red calverly jacket is adorable. Especially love the little details like the anchors in the snaps! Thanks for sharing!!! Don't you just love the anchor buttons?